QCT introduces QxStack Ubuntu OpenStack Edition, a converged cloud solution powered by The Canonical Distribution of Ubuntu OpenStack. It provides pools of compute, storage, and networking resources with HA, cost efficiency, reliability, scalability, and faster time-to-value. Furthermore, with MAAS and Juju, customers can deploy OpenStack services in days. Most companies hesitate about OpenStack and don’t even know how to start with OpenStack. QxStack delivers the fastest and reliable way to build an OpenStack cloud with the verified and thoroughly tested architecture. The HA architecture dramatically reduces time and risk associated with your OpenStack cloud projects. Deploying OpenStack consumes time. By leveraging Ubuntu OpenStack MAAS and Juju, you can literally go from bare metal to a well-configured OpenStack cloud in a day. MAAS can dynamically provision hardware nodes while Juju can orchestrate services in seconds. 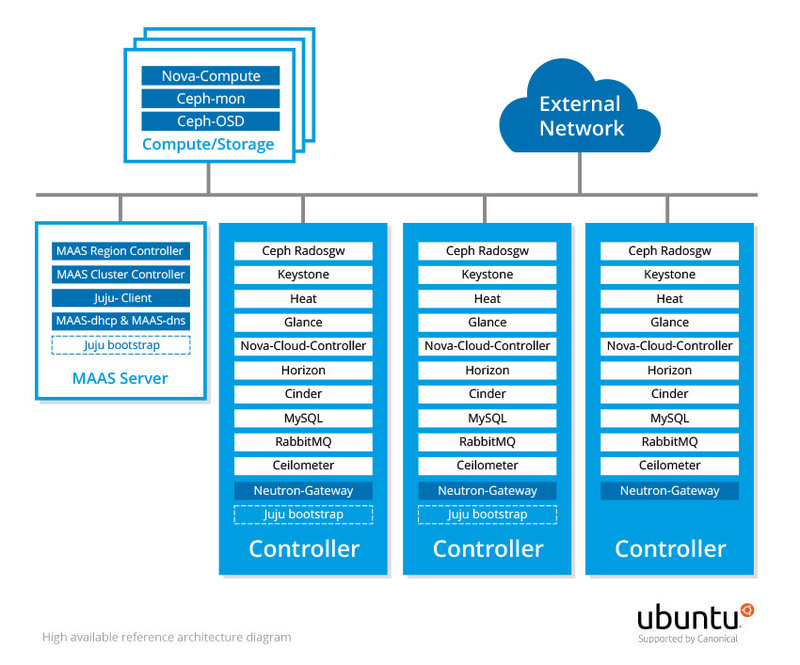 QxStack Ubuntu OpenStack can scale resources up or down without infrastructure re-engineering. Its scalability derives from the modular design on service. Each compute or compute-storage node serves as the expansion unit to scale out your resources. It significantly streamlines the cloud operations at scale in production. Instead of using proprietary expensive SAN storage, QxStack Ubuntu OpenStack utilizes distributed software-driven storage, and can be deployed in a hyper converged compute-storage architecture, which largely improves utilization of hardware resources. The solution also supports SDN and container technology. These innovations provide flexibility to construct a production cloud that meets IT and business requirements. QCT provides the complete product line and services from server, storage, network to rack and cloud solutions, and has considerable expertise in each component of the architecture. QxStack simplifies procurement and installation complexity and lowers the operating cost through one-stop shop. With QCT, you can fulfill all your OpenStack cloud vision under one roof. QCT QxStack Ubuntu OpenStack Edition delivers two models: QS-200 High-Density and QS-300 Rack for different demand and IT environments.